The internet was all a-squeal this week over the revelation that Harvard University’s libraries house a number of books bound in human skin. (Actually, the news that launched a thousand blogposts was that a Harvard-owned volume alleged to be bound in “all that remains of my dear friende Jonas Wright, who was flayed alive by the Wavuma” was, in fact, bound in sheepskin. ) Horrified and delighted, journalists gleefully explained that “anthropodermic bibliopegy” was once a thing, way back in the 16th and 17th centuries. Well, it’s still a thing. Canadian artist Tagny Duff undertook a project from 2008-2011 called The Cryobook Archives, in which she used human and animal skin and modern biotechnology to grow “living” covers for handmade books. Duff even used a sort of ink made from a lentivirus to make designs on the book covers, which she displayed in a custom-built cryogenic freezer unit. 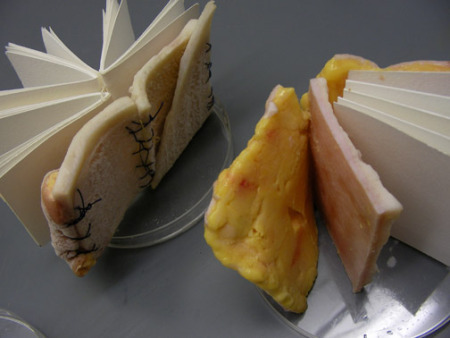 Duff explains that her cryobooks, which use skin cells donated by surgical patients and are stitched with surgical suture, are a way of reclaiming knowledge from its disembodied, electronic form. “We often overlook the fact that information is created from physical bodies” through the study of anatomy and biology. I’m not sure Harvard’s libraries would be interested in these particular skin-covered tomes. For all the years of study and preparation that went into creating their covers, these books are blank. Duff blogged extensively about The Cryobook Archives here. You can watch a video of her presenting the work at Dublin’s Science Gallery here. This entry was posted in The Art of Science and tagged anthropodermic bibliopegy, Cryobook Archives, Human skin bookbinding, science art, Tagny Duff. Bookmark the permalink.